Ninety people in a crowd of 35,000 is like a drop of water in the ocean. That’s what the “Run for Vocations” team was during the One America 500 Festival Mini-Marathon race on May 3 on the streets of Indianapolis. Despite being overwhelmed by so many other runners, the spirits of the team members were high before, during and after the race because they knew that thousands of prayers—prayers for vocations—were being offered for them. Father Rick Nagel, archdiocesan associate vocations director, the team’s organizer, said people from across America pledged on the team’s weblog to pray 402 rosaries, 33 Masses, 30 holy hours, 711 Our Fathers, 1,647 Hail Marys, 326 Glory Be’s and 219 Chaplets of Divine Mercy. Prayer was an important element for the team on the evening before the race. 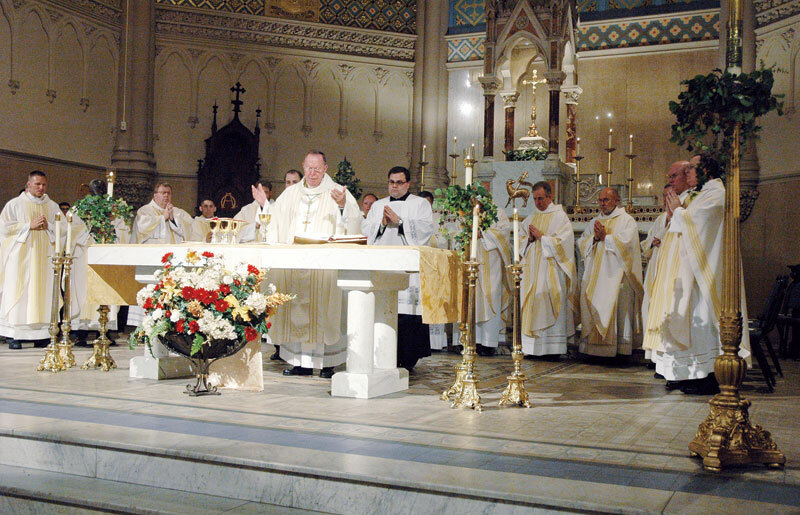 Archbishop Daniel M. Buechlein was the primary celebrant during a Mass for vocations at St. John the Evangelist Church in Indianapolis before the dinner at the parish. 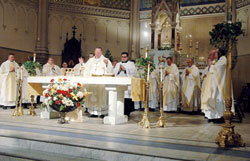 Fifteen priests, some of them members of the “Run for Vocations” team, concelebrated the Mass. Archbishop Buechlein valued the team’s efforts to promote vocations so much that he made an exception to his considerable reduction in public appearances in recent months due to the cancer treatments he has been receiving for Hodgkin’s lymphoma. Trent Engbers, a member of St. Charles Borromeo Parish in Bloomington and team member, came to the Mass and said he appreciated how exercise and prayer were coming together for vocations. “You’re running and you’re praying and you’re training,” said Engbers, 31, who ran in the race with his wife, Kim. After the Mass, members of the team loaded up on carbohydrates during a pre-race pasta supper hosted by the Serra Club of Indianapolis. Members of Bishop Chatard High School’s vocations promotion club SERV (Students Encouraging Religious Vocations) also volunteered at the Mass and supper. The team members all wore special blue and white shirts printed with the message “Vocation … Everyone has one. What’s yours?” In a circle around this phrase on the back of the shirts was a list of vocations—such as priesthood, religious life, marriage and sacred single life. After the race, Father Nagel, who ran the Mini-Marathon for the first time, said a number of other runners commented on the vocations shirt as they passed him. The shirt also provided help for one team member when it almost seemed like she couldn’t keep running. “The last mile was really grueling,” said Agenia Hurrle, a member of St. Roch Parish in Indianapolis and young adult mother of three children under age 5. Father Nagel said one of the team’s goals—to build up a culture of vocations in the archdiocese—has already been achieved by the team members and hundreds of people who made prayer pledges. Hurrle said being part of the team helped her value vocations more, and made it easier for her to ask others to pray for vocations. Father Nagel is excited about next year’s Mini-Marathon, too. So are other team members, who have stepped up to coordinate runners from other dioceses in Indiana to participate in 2009.